‘Sine Metu’ (meaning Without Fear) was John Jameson’s guiding philosophy. John Jameson founded Jameson Distillery in Dublin back in 1780. Since then Jameson became the most recognizable and sold Irish Whiskey in the world to this day. John Jameson was surprisingly a Scotsman but that didn’t stop him laying the foundation for the most famous Irish Whiskey. He used to enjoy sharing a drink and a story with his workers. And to this day you'll see two barrel men balanced on either side on the bottom of the label. These two men symbolize the generations of Jameson workers, who have labored with passion and commitment to produce Irish Whiskey. 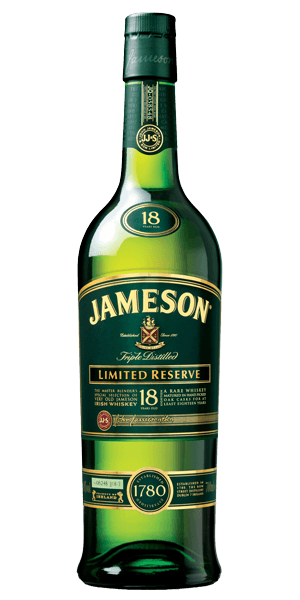 Produced in The Midleton distilleries situated in Midleton, Cork County, Jameson 18 year old has long been considered one of the brightest stars of the range. This blend of two pot still Whiskeys and a single grain is matured in Oloroso Sherry casks and finished in Bourbon wood for 6 months for a complex pot still character. 1) John Jameson used to enjoy sharing a drink and a story with his workers, so he also shared his label with them. And to this day you'll see two barrel men balanced on either side on the bottom of the label. These two men symbolize the generations of Jameson workers, who have labored with passion and commitment to produce this Irish Whiskey. 2) A shocker - John Jameson was a Scotsman. What does Jameson 18 Year Old Limited Reserve taste like? The Flavor Spiral™ shows the most common flavors that you'll taste in Jameson 18 Year Old Limited Reserve and gives you a chance to have a taste of it before actually tasting it. Aromatic oils, orange, apricot, dried fruits, a touch of wood and toffee. Water brings out Sherry, becoming chocolate and bourbon biscuit. Smooth, aromatic and refreshing. Toffee, spice, hints of oiled wood and leather, vanilla, Turkish delight and a Sherry nuttiness. A firm and long finish, oak, spice, toffee and unmalted barley. Even after 18 years, the pot still refuses to be mastered by the wood. And that’s good, by the way. Impressed by the extra smoothness compared to the typical Jameson. The scent of the caramel, oak and butter are delicious. The taste blended with the sherry and chocolate. It is an outstanding, balanced, Blended Irish Whiskey with an aromatic birth; while a smooth life leads to a long & balanced death. Excellent. My kind of whiskey! Very nice. I enjoyed the aroma and the taste. Just the right blend for sipping during an evening relaxing with friends. The different tastes that surfaced would not let the evening become dull. The best whiskey to ever cross my lips and enter my gullit. It has all if the light complexity of the other Jameson brands with a crisp and floral finish. I received this in a sample box and now I have to purchase a bottle. The best Whiskey I have ever had. A lot going on here, so complex. Soo much flavor, yet so smooth. The taste of oak that lingers in your mouth after a sip is exquisite together with the caramel aftertaste, a perfect nightcap in my book. Love this whiskey! Essentially, take Jameson and dial it up to 11. Very straight forward. Strong and you can taste the you can taste the oak barrel and the bourbon hint with a vanilla sweetness at the end. Very good I really enjoyed it and this review is not off of the whole glass gone yet. Sweet caramel scent. Big caramel flavor smooth and dry throughout with a spicy finish. As Jameson fav I was a little disappointed but only because i felt the taste and flavor was weaker than I expected. And hoped for compared to the other Jameson’s that are offered. This is hands down our favorite whiskey. Smooth with a little mild bite at the finish. A very easy drink! Smooth and a little sweet to start, with a mellow finish, admittedly, I’m new to whisky drinking but I really enjoyed this. Arrived just in time to celebrate the Washington CAPS Stanley Cup win!! This is my favorite whiskey. Ever. Delightfully sweet at beginning and end, with a spicy kick in the middle. Smooth and wonderful! Yum. Not a huge fan of Jameson's normally but this stuff I do like... a lot. Incredibly smooth. Nose is fruity (apricot, banana) with underlying woody aromas and cocoa. Prominent flavors include caramel, spice (nutmeg, some white pepper), dried wood, leading into a drying finish. Body is light and very sip-able. A very solid whiskey, though I've had better at a lower price point. It's good. It's Jameson. Nothing fantastically special, but Jameson sets the bar high in the first place. Nothing about this sets it apart from other Jameson. My personal preference from them is the 12 yr old. Just a fantastic drink. Enjoyed it neat and there was just a bit of spice to it. Not as good as you might think. Don't get me wrong, its good - but its not great. Caramel and spice are nice, but there is no follow through. Best Irish whiskey I’ve had. It’s a bottle of few words, which is why this review is so brief. My go to whiskey. Super smooth and tasty. Amazing flavor profile! Love it. Excellent whiskey from start to finish. Wonderful taste. The second best liquor i have ever had.. Extremely smooth, perfect with 2 cubes. This was definitely the best of the tasting box. I love Jameson as it stands, so having a higher class version made it all the better. Definitely a great tasting whiskey. The best of the three in my tasting box. Premium Jameson whiskey. Does not disappoint, a more sophisticated offering by the Irish master distiller. Bought a bottle on my way home. The best drink I've ever had, and was able to enjoy it with a few of my brothers in arms. Haven't been able to find a bottle since. Jameson has always been loyal to me for celebratory events but this one will take time to get used to for my collection. Extra Smokey. I love it when we're cruising together. Good, but not as good as I was hoping. Slainte! A most excellent whisky! Initial sweetness with a hint of smoke and spice. Wonderful! Oh my god was this delicious!